Since Kirk has completed his aspiration, the family was able to build the first public lot, a memorial park dedicated to their recently deceased friend. I have chosen to only build the park for the money the Bloomers actually have in their family funds – I would have liked to place more shrubbery around, but they simply couldn’t afford it. If you’d like to download the lot for your game, note you can find me on the gallery under the name ThePlumbobBlog. Note that the name of the park spoils who dies in the series, so make sure you’re all caught up with the Bloomer family before looking it up. The lot comes with a tomb, a ghost and a dead cow plant. The chess table that’s cost us so much. The kids pirate playground incorporates the dead cow plant. The garden with Kirk’s plants. As for the Bloomer family, their new home is located near the canal where Kirk first declared his love to Maranda. They have also have a fishing pond in the back yard, which is convenient for Kirk’s new aspiration; Angling Ace. Kirk likes to spend his days fishing, but knowing he’s not too far from Maranda. The kitchen/dining/living room area. This is the most furnished part of the house and certainly a step up from the previous home. While the family’s life is no longer as rural as it used to be, it was still important to Kirk to include many plants in their home. The bathroom is quite luxurious compared to its predecessor as well. The bedroom is fairly simple for now. And yes that is a baby in the room on the left… but let’s not get ahead of ourselves. Until next time! He had it put into a ring! Kirk took Maranda to his favourite part of Newcrest, took a deep breath and surrounded by flowers, he proposed. Kirk couldn’t believe his luck. Even in his wildest dreams he couldn’t have imagined that he’ll meet a woman like Maranda in Newcrest. More than ever, he was determined to create a community that will be the heart of the town for years to come. For his and Maranda’s legacy. In preparation for Maranda moving in, Kirk decided it was time for some home improvements. Oh the luxury of a separate bathroom! The big day has arrived! Maranda contemplated what becoming Mrs Bloomer had in store for her. As for Kirk, as soon as he saw Maranda in her wedding dress, he couldn’t take his eyes of her. The couple invited their close friend Bob Pancake, Kirk’s number one fan Howard Bloomer and also Kirk’s friend Ruby Perrin, who opted to wear a completely outlandish outfit. Perhaps it’s a good thing Kirk never developed feelings for her! The last guest was Summer Holiday – while she is not very close with either the bride or the groom, she’s always been friendly to them, and I’ve always liked her. The ceremony was small and simple. The couple didn’t have much money – Kirk couldn’t even afford a tuxedo and had to make do with borrowing Bob Pancakes’ old blazer (Bob swears he could fit into it not too long ago… but he has no illusions of ever losing the weight again. He let Kirk keep it after the ceremony). Of course, it wouldn’t be Kirk if there weren’t flowers everywhere. The arch the couple exchanged their vows under, along with the shrubs around it was going to become a part of the public park and remain there for many joyful occasions to come in future generations… or so Kirk and Maranda hoped. And for the first time, Mr and Mrs Bloomer kissed. (Well, not quite. I still have to change Maranda’s last name to Bloomer. I do wish the game gave you a popup option to change the newlyweds’ last names after the ceremony). The party was somewhat unconventional, with the bride frying up whatever fruits had in the garden to feed the guests, and Summer not being able to put off her work out routine just for a bit. But everyone had fun, and the love of the newlyweds was contagious. Ruby looks genuinely happy for them in her hideous unique outfit. Howard Bloom seems to be a fan of the ensemble though. And the bride and groom couldn’t have a care in the world for their guests’ fashion sense. Or anything else, for the matter. The following day, the couple celebrated their birthday. Maranda even went through the trouble of making two cakes! She wants to be in the culinary career, so the cooking skill will definitely come in handy (although Maranda’s ultimate goal is to become a Master Mixologist). We got her a bar to practice on, and Kirk caught up with the plants to give them much needed attention after the last few days’ festivities. I’m not sure if Kirk can handle having a mixologist in the house though – hopefully he won’t become too much of a juiceoholic! Towards the end of the event, one of the chairs catches on fire, but Maranda has it under control, and the event gets a gold rating just in time for the guests to enjoy the last few minutes of the party. Ruby! When did you catch on fire? And how come we never noticed? Nooooooo! Here lies Ruby Perrin, a beloved friend. Children don’t play with fire. On the bright side, our cow plant grew up! Maranda turned to juice for comfort. Perhaps she drank a bit too much of it, or perhaps it was her conscience acting up, but she could have sworn she saw Ruby clean the grill from beyond one night. Oh Ruby… I’m so sorry! Kirk and Maranda knew it was time to leave. Kirk reached the top of the Freelance Botanist aspiration, and they saved up enough to convert the plot of land into a proper park. They would dedicate the park to Ruby, and leave her memorial behind. Hopefully they will have better luck in their new house. Another day, another round of collecting, gardening and fishing for Kirk. As an outdoorsy sim, he is loving all of these activities. And with a view like this, who wouldn’t. As for the ladies, he hasn’t stopped thinking about Maranda. However, I’m reluctant to jump the gun just yet and am still on a lookout for a lady for Kirk. Paulina here appears to be on a lookout for Kirk. The cougar approaches… poor Kirk is not sure how to turn her down politely, and s wishing he could swap places with Bob Pancakes who is just casually rummaging the bins in the background (he seems to be doing this a lot in this save). Being the unofficial founder of Newcrest, albeit homeless, has made Kirk very popular with the female part of the population. Katie wasted no time hitting on him. Paulina is not pleased. As for Kirk, he is enjoying his popularity, but doesn’t quite know how to handle it. He rambles about how friendly and welcoming the neighbourhood is in the hopes of distracting the women. When Maranda struts by in her cute mail courier outfit, he loses completely focus, and the women storm off. Kirk decides to focus on gardening instead. He’s purchased an actual planter box that he filled with yummy strawberries, and his gardening level is now high enough to evolve plants. He swaps numbers with a pretty stranger he meets while fishing, but later learns that she is non-committal… not the best legacy spouse material. I also have Kirk meet up with Ruby again and the two get along nicely, but he just doesn’t seem to see her as more than a friend. Perhaps a little chat with the guys will help? Bob isn’t feeling the conversation about relationships, since it reminds him of his unhappy marriage too much, but Howard Bloom seems enthusiastic about the female attention Kirk has been getting… with their last names almost identical, Howard can’t help but live vicariously through the founder. He is already hoping he might get away with claiming him and Kirk are related. It becomes abundantly clear that my efforts at giving all women of Newcrest a fair chance are completely futile when Kirk gets a whim to kiss Maranda (in spite of them not having been romantic before). I suppose I’ll have to accept it as destiny and let them go on a date. Ever so the gentleman, he even brings rose from his garden. He doesn’t own much, but he wants to share it all with Maranda, he says. Slow down Kirk! It appears the romantic proclamations and the flowers have worked on Maranda though, and the two share their first kiss. We also learn that on top of being outgoing and perfectionist, she is also a genius. This woman is annoyingly perfect! If Kirk is serious about Maranda, I doubt he’ll impress her much with his tent living. Luckily he’s finally accumulated enough money to build himself a little shack. Nervous, he invites her over and makes a silent wish that she won’t mind his unusual living situation. Being the ideal woman (I must work on my rage), she does not. Naturally Kirk is on top of the moon. A new house, a new love, this calls for a celebration! He throws a weenie roast party. I actually have an agenda – I would really like to incorporate the chess set from Outdoor Retreat in my community park. That however means that Kirk must somehow throw a gold weenie roast party. He thinks telling everyone a ghost story should do the trick. Maranda humours him, but you can tell she’s not scared one bit. We fail to roast 3 hot dogs in time and the party is not even a moderate success. It doesn’t seem to bother our too lovebirds too much. They dance the night away, with the city lights and the fire pit being the background to their nauseatingly adorable love story. Sigh. Weenie roast attempt number two. Determined to succeed, I force Kirk spend the entire time grilling hot dogs furiously to achieve our goal. But somehow it turns out to be even more of a disaster. Maranda looks to Kirk, foolishly hoping he’ll save the day, but he’s completely panicked. The other men are not much better. Somehow we manage to put the fire out in the end, and that concludes our weenie roast efforts for now. Hopefully third time will be the charm, once Kirk (and I) muster up the courage to go through this ordeal again. To prevent future fire incidents, Bob gives Kirk lessons on using the grill, AKA How Not To Burn Your House down 101. Speaking of the house, Kirk’s working on making it a bit cosier, and he even gets a pet. The biggest triumph however is his own toilet. Having a toilet two steps away is hip… honest. Not being able to go to Willow Creek or Oasis springs, Kirk and Maranda’s dating spot options are fairly slim, but they make the most of it. He professes his undying love to her by the canal. It goes down so successfully that another addition to the house is necessary. Did anyone say Woohoo? I’ll leave you with a final look at Kirk’s humble abode. He’s very proud of all that he’s accomplished, and so am I. Until next time! I have always been a legacy style player. Granted, the furthest I’ve ever gotten was generation 6, but nonetheless, playing one family for generations and bringing them from rags to riches is my preferred way of playing (although I tend to try to put off the riches part for as long as possible). I’ve been intending to start a new legacy for a while, and wanted to incorporate the town of Newcrest somehow. Luckily I came across Simply Vanilla Sims Blog and her #BuildNewcrest legacy challenge. What this essentially is is a legacy challenge with a bit of a twist, as your family has been given the task of building the Newcrest neighbourhood from scratch. You start in the blank world and each generation has a specific goal, such as building the community park, gym and so on. For a full list of rules and background information, you should definitely check out ShadyLady_DQ’s original thread on the challenge here. Meet my founder, Kirk Bloomer. He loves the outdoors, is a perfectionist and is a cheerful sim. With no possessions to his name – other than his positive attitude and enthusiasm – he could not believe his luck that he became the sim responsible for building the Newcrest community. In line with the challenge’s rules, Kirk’s main quest will be creating the community park – his family’s lot will become the public park once he fulfills the Freelance Botanist aspiration. I have decided to start off with no money whatsoever (this is not an official requirement of the challenge, just my own sadistic preference). Additionally, I am also making the challenge a tiny bit harder by not allowing Kirk to get a proper job. The challenge does not allow Sims to leave Newcrest (with the exception of Magnolia Promenade and Granite Falls), and my take on this is that since there is no businesses in the area yet, there are no jobs he could actually work that are close enough for him to get to. It will be Kirk’s job to attract investors to the area and make sure his family members will struggle less than himself. This means Kirk will primarily be earning money from gardening, fishing and collecting. Collecting is especially important at this stage, since he is going to need a place to sleep in tonight, and with no skills his chances of catching a fish are pretty slim. Also, he’s going to need to collect plants in order to start his dream garden. Searching for frogs is my favourite method and is actually more profitable than some simmers realise. Once you have two frogs in your inventory, you can breed them to get an extra frog to sell for cash. This gets especially fruitful if you happen to breed two rare species. As the founder of the neighbourhood, Kirk introduces himself to the locals. They don’t seem to have a lot of faith in him quite yet, but hopefully he can convince them that he can make Newcrest the place to be, starting a thriving community with a park at its heart. Being restricted to an empty neighbourhood and starting out practically homeless can prove to be challenging, considering I can’t send Kirk to the gym to shower or mooch some food in the Magnolia Blossom park. Luckily, I was pleased to discover that the neighbourhood provides for most of his needs, with public toilets and grills being practically at his doorstep… if he had a door, that is. Nina Caliente appears to need to use the restroom as well – perhaps the ladies loo is clogged? I have never played with any of the Calientes (unless Don Lothario counts) in the Sims 4 and would love to change that, so Nina might well be future partner material (although I’m fairly certain she does not quite want to commit to anyone). After gathering all that was humanly possible to collect in the area, including what will hopefully be the start of Kirk’s dream garden, it’s time to catch some dinner… So far it’s not looking too promising, and Kirk’s stomach is growling. Luckily Bob Pancakes comes to the rescue and fries up a burger for Kirk. I think this is a beginning of a beautiful friendship! Kirk was able to purchase a tent by the funds he got from collecting, so he will not have to sleep on the bench tonight. He sets up his garden by planting some flowers on the each side of the entrance, waters them and calls it a day. Time to get some rest! Waking up dirty and smelly, unfortunately Kirk will have to complete a round of collecting before he can afford to clean up. Perhaps I should have let him spend the night on the bench and invested in a shower first? Luckily for him, all of the plants in the area were ready to harvest, bringing the much needed cash. Kirk was able to purchase a camping shower (with mysterious plumbing) and scrub away his blues. Being all clean presents the perfect opportunity to meet the ladies. This is Ruby Perrin. I don’t know much about her yet. but she seems cute and her and Kirk get along well. Definitely a contender. While having dinner, another lovely lady, Maranda Bales, catches Kirk’s eye. I feel like her outfit seems to insinuate she might also be a gardening enthusiast, and the way her dress matches the cherry blossoms around certainly works in her favour. Kirk seems to think so too – he can’t take his eyes of her. We learn that Maranda is outgoing, and a perfectionist just like Kirk. Being a mail courrier, Maranda has taken on the task of delivering post to the residents of the neighbourhood, in spite of nobody having house numbers quite yet… or even houses. It’s been quite a day for Kirk, so he’s going to say his goodbyes to you for now and head off to bed. Until next time! I became nostalgic about the good old The Sims recently, so I dusted the trusty old game and crossed my fingers that it would run on my machine. I swear that if EA re-made this game with better graphics and toddlers aging with the exact same expansion packs, I would just eat it up – and I bet I wouldn’t be alone. While I enjoyed several of the expansions further down the line in The Sims series – University and Open for Business will always have a place in my heart – I don’t believe the franchise ever managed to get its expansion packs as spot on as they did with the first game. Create a Sim was a tiny bit fuzzy (aside from the fact it can obviously not compete with its The Sims 4 counterpart), but apart from that the graphics did still seem to work fine in my game. I popped my sim into the neighbourhood, and after spending a few minutes fawning over getting reacquainted with the original Mortimer and Bella Goth, I promptly got her a an agent and sent her to Studio Town to find fame. I just adored The Sims Superstar. From the jingle recordings and hilarious soap opera scenes to fashion shows and the spas, the only thing I did not care for was the obsessed fan. But this time around, I even welcomed seeing him, for old times sake. The highlight of my Studio Town visits must surely be bumping into the Sim version of Avril Lavigne… ah, the memories. While I did focus mainly on the Superstar gameplay, I did also attempt to have my sim go on dates Downtown – with little success, but those who follow the story of my sim Vanessa know that problematic love life is a recurring theme in my sims lives. Note to self: If you go on vacation in the hopes of finding a significant other, do not attempt to wash random strangers who join you in the hot tub; it (almost) never goes down well. 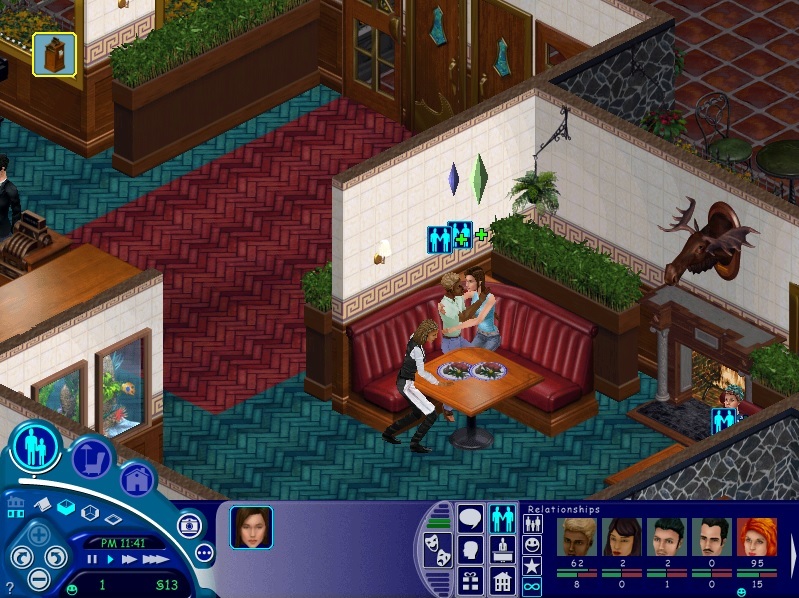 On the odd chances the dates were going well, I reveled in seeing my cuddling in a restaurant booth again, something that I really wish – but do not dare to hope – returns in The Sims series. I also caught a glimpse of the lovely Miss Crumplebottom; though sadly my dates never went smoothly enough to see her in full on action. Further down the list, I also popped down Magic Town and turned a mean sim into a toad, sent my sims on a brief holiday in the mountains and adopted a puppy that only peed in the house occasionally. I’ve spent a good (or bad, depending on how you look at it) amount of hours in game in the past couple days, and I barely scratched the surface of all there is to do. However, I already feel like I’m simmed out. Why, you ask? The logical answer would perhaps be the dated design – I really struggled to find clothes and furniture I found appealing. But with a fun game like The Sims, I could easily see past that and even appreciate the reminder of how fleeting trends are. No, the main reason lies elsewhere. It turns out The Sims is an incredibly hard game. 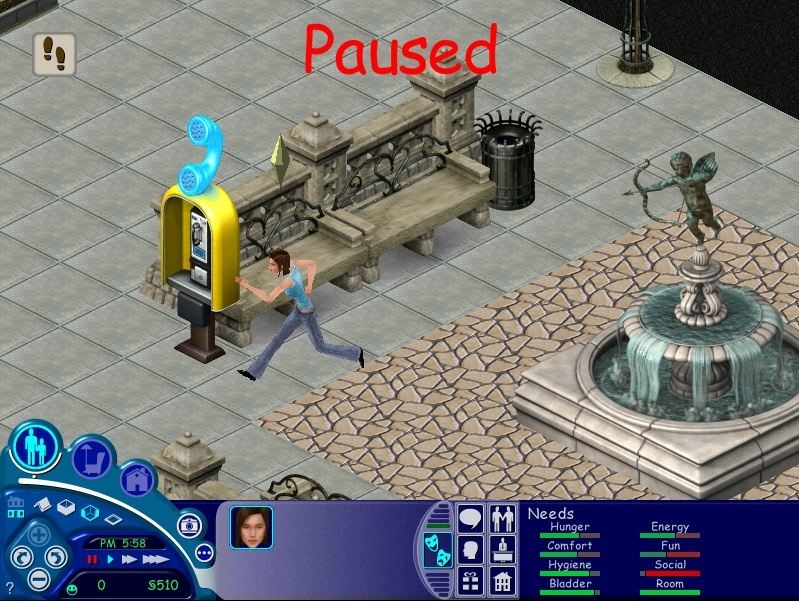 The sims’ motives decline at light speed, meaning it’s almost never a good time to do anything. Your sim wakes up hungry, smelly and bored, and by the time you’ve gotten their hunger, fun and hygiene up, they are exhausted again. I like a bit of a challenge, but you always seem to be dirt poor and your house is constantly infested with roaches and flies… and did I mention the daily raccoon visits? I’m not saying this means The Sims 1 is a bad game, on certain levels it still beats its successors and it was revolutionary at the time of its release. The issue is that we as players, or certainly myself at least, have become spoiled and expect our sims games to be smooth and easy. Making the game more challenging indirectly causes you spend more time caring for your sim and less time exploring features added with expansions, creating the illusion that there is more content in the game. (Note: I still do believe The Sims 4 needs more content, but considering how easy it is to keep our sims in a relatively good mood, naturally you run out of things to do with them quicker). All in all, I may still return to The Sims 1 every so often when I feel like reminiscing on snowboarding, carnival games, picnics on a blanket, preserve making, modelling and finding your prince charming by kissing a toad… but in the interest of not feeling drained after a game session, I will stick with the more recent iterations of The Sims – for now. While I am mainly a legacy style player, meaning that I like to stick to one sim family for several generations, I always get restless if I play in the same area for too long. That’s why in The Sims 3, I often uprooted my legacy family and moved them to a completely different environment, and I appreciated the diversity of all The Sims 3 worlds. Naturally, once Newcrest has been announced I couldn’t wait to get my hands on it to give my sims a bit of a change of scenery. Come join me on a first impressions tour of the new world! The map view of Newcrest shows us the world is divided into 3 different areas, which is already more than we have gotten with the worlds that came as paid content. 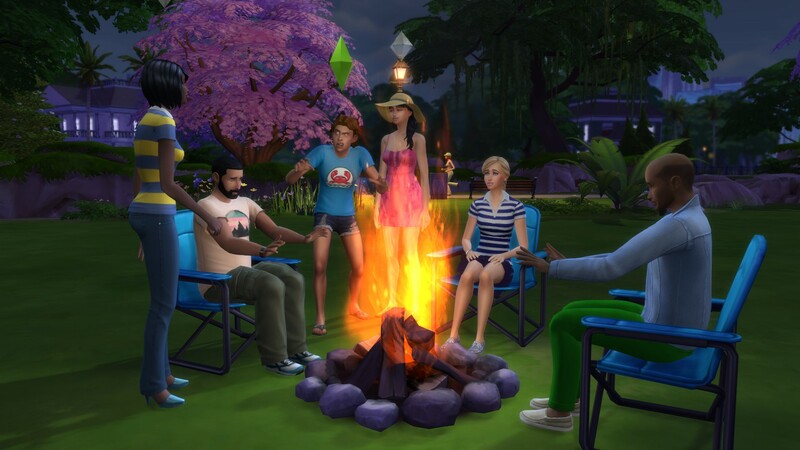 I commend EA for releasing this as a free update, as it shows they do listen to the simming community (and lets face it, is probably going to help them with the sales of the Perfect Patio Stuff pack coming out next week). I’m going to refer to each of the neighbourhoods within Newcrest in the order I visited them in for the purpose of the review (see image above). The first thing that struck me when I loaded up Neighbourhood 1 was that we are definitely getting closer and closer to the city. Some of the background buildings seem very reminiscent of apartment style buildings – perhaps this is a hint of a city life expansion on the cards in the near future? (Note, I firmly stand in the semi-annoying toddler fan group, meaning that my preference would be a family-oriented EP before anything else, but let’s be honest… I’m bound to jump on whatever expansion pack comes out next just the same). To me, Neighbourhood essentially looks like an extension of Magnolia Promenade. The area is lovely and looks ideal for a commercial district, but it doesn’t necessarily add much of a new feel. Considering the minuscule size of Magnolia promenade, an additional neighbourhood with a similar style is not necessarily a bad thing though. I also do enjoy the canal flowing through this neighbourhood, since it adds more character to the area – in spite of it mainly being just for show. Neighbourhood 2 is probably my favourite addition to the game. The area combines a a park-like region with the backdrop of skyscrapers – Central park anyone? I feel like this neighbourhood is the biggest change of scenery and look forward to placing hip urban developments in the area for all of my young and trendy sims who are way cooler than I am. I also feel that the second neighbourhood features more details than the other two, such as the adorable boat in the picture above. The only downside is that there’s no way of getting your sims close to them, but I still enjoy the new backgrounds. On the other hand, I have the impression that the backdrop areas seem to get more blurry in Newcrest than in the existing worlds, but I’ll have to play in the area a bit more to be sure. The skyscraper-free area of Neigbourhood 2 reminds me of the Willow Creek neighbourhood where Oakenstead and Cypress Terrace are. Considering I find that particular neighborhooud the richest and most interesting area that came with the default game, this can only earn brownie points with me. Finally, we get to Neigbourhood 3. Again, high rise buildings are prominent in the background, but this area includes a lot more foliage than the previous two we visited. It sort of feels like Magnolia Blossom meets Sims 3 Into the Future, and the emphasis on nature so close to the big city is an interesting concept. My initial thought when I saw the neighbourhood was that there was a lot worth exploring and I wouldn’t be surprised if it even had a secret passage to a new hidden lot. However, on further inspection I realised that your sims can only venture into a small portion of the area and most of the park is indeed just a backdrop once again. As I said, I am always on the lookout for a slightly different scenery, but I can’t help but feel that minimising this into scenery only is a missed opportunity. All in all, I am quite pleased with the new world though – the sheer fact that all of this content is available to everyone for free makes it hard to complain. I do hope that we will get more diversity in future world themes to allow players to have a truly different experience, even if this means the experience is paid for. Until then though, I am grateful for having the possibility expand without being restricted to the same old lots I’ve played with before. Side Note: I have not touched on the fact Newcrest is a fully blank slate. In previous Sims games, this would have been a serious issue for me, as I am by no means a great builder and I am only in the mood for building every so often. With the brilliance of The Sims 4 gallery and EA’s inventive idea of inviting the best of community builders to create homes for the world under the #buildnewcrest tag, this is no issue at all. Of course one can think it’s a sneaky move of EA to put all of the responsibility of populating the world with houses on the community, yet you can’t deny the genius of the idea nonetheless. Sure they made it easy for themselves, but with having such an elegant solution at their disposal (and getting two birds in one stone in terms of the community promoting the world’s release), who can blame them? I for one am completely happy with the solution, and am heading to the gallery to download some of the homes tailor-made for Newcrest as we speak. What are your thoughts on Newcrest? This review was originally published on 1st April (i.e. before the Get to Work expansion pack release). 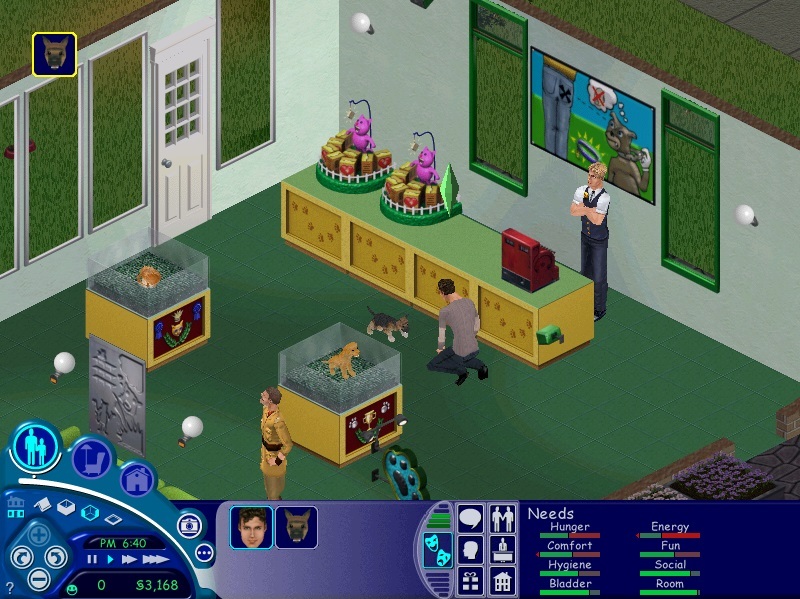 The Sims franchise has been something near and dear to me for the past 14 years. The series have been with me from my awkward teen years (including the brief dark and gothic phase) and throughout university, all the way till now. At 27 I should by all means be considered a grown-up, and yet whenever I hear about a new Sims game being released, it ignites a child-like spark within me. The announcement of The Sims 4 was of course no different. I was ecstatic to see how the series can be improved and how the amazing ideas from The Sims 3 can be taken to the next level. Unfortunately, as more information got released about the upcoming instalment of the game, I had for the first time experienced disenchantment with my beloved series. The endless cycle of Create A Sim videos combined with marketing catchphrases and constant news of missing features causing community outrage made me all but hopeful for the sequel. I was ranting about how my favourite game being ruined to anyone and everyone that would be willing to listen (and in many cases, to the lucky friends and relatives who wanted to hear nothing of it). I dramatically proclaimed that this was indeed going be the first The Sims game that I would not be purchasing… and then, having watched a couple Lets Plays, I folded and got the game a few weeks after its release. With the game being out for approximately half a year now, I thought this might be a good time for me to review it. While I was originally sceptical about content that The Sims 4 was lacking compared to its predecessors, I soon discovered that the new incarnation of the game is incredibly fun to play. It runs significantly smoother to the bugfest that The Sims 3 – as much as I adore it – turned into. Playing out the stories of the sims in The Sims 4 is very compelling, and injects endearing and humorous aspects into the game; something reminiscent of the original Sims 1 game that perhaps got lost from the series over time. I found myself being much more willing to experiment with my sims lives and the styles of my gameplay, perhaps because the game does not strive for as much realism as it’s last iteration, and instead goes for a charm I can only describe as quintessentially sim-like. That being said, I’m far from being oblivious to what the game lacks. Although not ideal, I’m willing to deal with loading screens if this means an improved gameplay performance overall, providing the loading times will not increase too drastically as new content is added to the future. On the other hand, I’m definitely in the camp of simmers who demand toddlers. However mildly annoying the life stage may have been, I feel like the endearing moments compensated for it my far, and I find that this feature missing from a fourth generation of a life simulation game is inexcusable. When it comes down to it though, the game will only grow with future content and I have made my peace with toddlers missing from it… for now. I am interested to see how re-introducing toddlers into the game will be handled in the future. Something I’m still torn about is how task-oriented most of the gameplay is – the career progression and the aspiration milestones both require the player to go through a motion of set actions. While these are entertaining to discover at first, I see them as problematic in terms of replay quality. The tasks can get quite repetitive and I find myself not wanting to choose similar aspirations or careers for my sims in close succession. Of course, one could say that this contributes to the previously mentioned experimentation with different ways of playing the game. Fingers crossed that future expansions will add so many careers and aspirations that the repetiteveness will become less of an issue. For now we can only speculate on how the high emphasis on tasks will stand the test of time. As much as this was overplayed prior to the game’s launch, I must say I’m thoroughly impressed with Create A Sim and Build Mode. A big chunk of Create A Sim might be wasted on me, as I always end up going for sims with similar facial features, but I love the extent to which we can customise the sims bodies and go wild with the sims curves. Tugging and pulling to adjust comes natural and I must confess I barely remember how to work with sliders anymore. The improved Build Mode is even more exciting. I’m not sure how advanced builders feel about it, but for me I now finally enjoy creating houses again. It’s very fool-proof and if the player messes up or changes their mind, everything is very effortless to fix and modify. In The Sims 3 I actually really disliked building and used pre-made homes for the most part, although I would only build my own houses occassionally, while now I love putting my own stamp on things. It would be a gross oversight not to mention Create A Style in this section. I did use the tool extensively in the previous game, but I suspect this is what took the enjoyment out of building (or even planning outfits) for me. The building process would take forever and be horribly laggy. While taking Create a Style out was highly criticised and reduced the level of customisation greatly, I do partially attribute its lack to making building fun again for me. Nonetheless, it is a shame that some objects simply do not come in colours that would at least remotely compliment each other. I do hope that the game will move towards a more The Sims 2-esque and give the player a chance to select various pre-made parts of an object (such as changing the colour and style of bedsheets and headboard separately) to prevent the more design-minded of us from going crazy. EA’s attitude since the release of The Sims 4 is probably the main reason why I fell back in love with the franchise all over again. The gurus have been tirelessly scouting for player feedback, and more importantly, they are listening. Since the September launch we got not one but several free updates, adding frequently requested content like ghosts, pools, the MoveObjects cheat and all new careers with no additional cost. The Outdoor Retreat game pack shows a lot of potential, and although camping is not really my cup of tea, the quality of the pack’s additional content makes me hopeful for what’s in store. I do wish that bugs were addressed a little big quicker (the infamous fridge bug is still causing havoc in my game), but apart from that I feel the game holds a lot of promise. I’m not afraid to say that all of the Get to Work trailers are making me feel giddy about the series once again, and I do believe that the future of The Sims is bright. Welcome to my humble Sims blog!